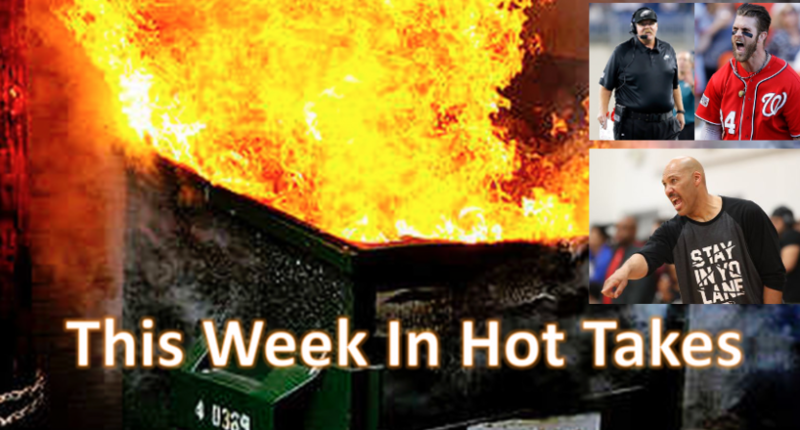 This Week In Hot Takes: Nancy Armour calls LaVar Ball "worst ever"
This week's hottest takes were on LaVar Ball, Philadelphia, late MLB starts, Bryce Harper, and LeBron James. Welcome to another edition of This Week In Hot Takes. This time around, we’re breaking down the hottest sports media takes from Sept. 29-Oct. 5. Six minutes and eight seconds. That’s how long superstar right fielder Bryce Harper spent with a cluster of playoff media Thursday in the home clubhouse at Nationals Park. And, boy, were we ever entertained. For 6:08, he answered questions in unbroken monotone. For 6:08, he gave us unflinching expressionlessness. Is this the NLDS or the World Series of Poker? …You know that iceberg-melting smile you see on Bryant’s face in photos and on television? He has one of those for everybody he encounters, right down to the pushiest, most annoying writers. And that’s on an everyday basis. …Harper is doing things his way. It’s not like he isn’t thriving. Hey, whatever works. Although the monotone and the poker face sure aren’t going to win him any popularity contests. Bryant, meanwhile, figures he’ll stick with the Mr. Nice Guy routine no matter how outsized the attention and demands that come his way. This is a poor take on a number of levels. First, who is Greenberg (or any media personality, for that matter) to tell Harper what his facial expressions should be like? What possible impact does that have on his play, which is what we’re supposed to be talking about, right? Most general managers would probably be thrilled with a guy who hit .319/.413/.595 with 4.8 wins above replacement (by Fangraphs) regardless of his facial expression. Yes, Bryant produced an even better 6.7 WAR thanks to superior defensive contributions, but that isn’t really about his smile. And it’s odd for a media member to be telling an athlete they cover not just that they should feel a certain way (joyful), but that they should be expressing that outwardly. 3. Phil Mushnick hits the MLB/ESPN/late-game bashing trifecta: New York Post columnist Mushnick has become so predictable and stale in his bashing of late games that jokes were flying around about his anticipated column on Tuesday night’s New York Yankees-Minnesota Twins game long before it ended. Mushnick didn’t disappoint, and managed to blast regular foes MLB and ESPN along the way in a column titled “MLB, ESPN combine to make greedy, ugly playoff mess.” Here are some lowlights. Once, as a matter of common sense and greater-good decency, it would have been impossible, but Tuesday’s Twins at Yankees AL wild-card game began at 8:10 p.m., ESPN-standard time. Eight and one-half innings later, it ended at midnight. This is the new norm, hard, indisputable evidence of MLB leadership continuing to place money far ahead of the good and long-term welfare of The Game. Still, commissioner Rob Manfred shamelessly declares that MLB’s No. 1 priority is to ensure that America’s children become and remain baseball fans. …For the past two years, ESPN’s lead MLB trio of Dan Shulman, Aaron Boone and Jessica Mendoza, with generous portions of Buster Olney and Tim Kurkjian “down on the field,” has been met with widespread disgust for the inability to allow even one groundout to occur without a full-blown, multiple-speakers analysis (steeped in “perhaps”) of what just happened and why it happened, and now to an in-game, split-screen taped feature about someone or something. Surely, if ESPN’s geniuses can’t figure it out for themselves, they have been told. Thus, ESPN either doesn’t care or doesn’t believe it. Or is it that ESPN execs enjoy the way ESPN destroys baseball games? During Tuesday’s third inning, the Twins, down a run, had first and second with no one out. Yet, for all the non-stop talk, that the Twins, under Paul Molitor, didn’t even attempt a sacrifice bunt — especially in a league with the DH — impossibly went unspoken! In order: no one cares about your bedtime, Phil, there are time zones outside of Eastern (and people who watch there too, and they often work until 5 p.m. or later, which is why 8 p.m. Eastern is generally considered prime time in the U.S.), the long-term welfare of the game involves more than the preferences of ancient grumpy columnists from New York, 20-plus critical columns from you does not equal “widespread disgust” or “destroying baseball games,” and stop bunting. Oh, and Mushnick managed to be typically dumb about the NCAA scandal too, throwing around “sneaker pimps” and saying that shoe companies are ruining sports…because of gray and black uniforms? 2. Colin Cowherd calls Philadelphia “the dumbest sports city in America”: No one does more team/city/regional/country trolling without much evidence than Cowherd, and he was in fine form on that front again this week, going after Philadelphia for…not properly appreciating Andy Reid? So maybe we are dumb in Philadelphia, because how else would you explain getting all hot and bothered by some radio blowhard in a cushy Los Angeles studio who has to stoop so low to make the same tired lame jokes about whatever team he happens to set his sights on? So go ahead and attack us from your radio studio and behind the TV cameras, Cowherd, because you can feel secure lobbing verbal jabs at a market with no interest in listening to your show, and you will not have the courage to come on a local sports radio show to defend your ridiculous comments. We can take it, because we’ve heard it all before. Your rant was nothing more than the recycled garbage that has been hurled our way far too many times over the years by voices more creative and unique than you anyway. We may have our faults, but at least one of them isn’t bowing to your ignorance and pompous jackassery of a clown show just because you are a national radio guy. The really amazing part is that Cowherd has continually insulted the intelligence of certain regions (Philadelphia, the Midwest, Iowa, New Orleans, etc, etc) that have plenty of theoretical listeners and viewers. And yet, he still somehow has a show. LaVar Ball has done what once seemed impossible. Not create the world’s greatest basketball player – the jury will be out on that for a while, though early indications are not promising. Nor did he create a model athletic experience or dynasty that will be remembered for years to come. No, what Ball has done is finally supplant Marv Marinovich as the worst sports parent ever, a title Marinovich had a lock on for 30 some years. Until now, Ball has been a caricature with his outlandish claims and delusional view of his and his sons’ talents, the basketball equivalent of a Kardashian. With his announcement Monday that he is pulling youngest son LaMelo out of high school so he can make him “the best basketball player ever,” Ball crossed into troubling territory. These are children he’s raising, not commodities, and the ramifications are huge when a parent forgets there’s a difference. When overall This Week In Hot Takes leader Stephen A. thinks you’ve gone too far, you know you have a problem. Notable absences: Stephen A. Smith, Shannon Sharpe, Rob Parker.